Our brief was simple, to create a highly impactful advert for this new Government department that emphasised the critical nature of the role and the potential impact that the person appointed could have on all ours lives. Our backdrop was that whilst significant global commitments had been taken at Kyoto and subsequent environmental summits, but the reality and the political will to implement those commitments was a different story. 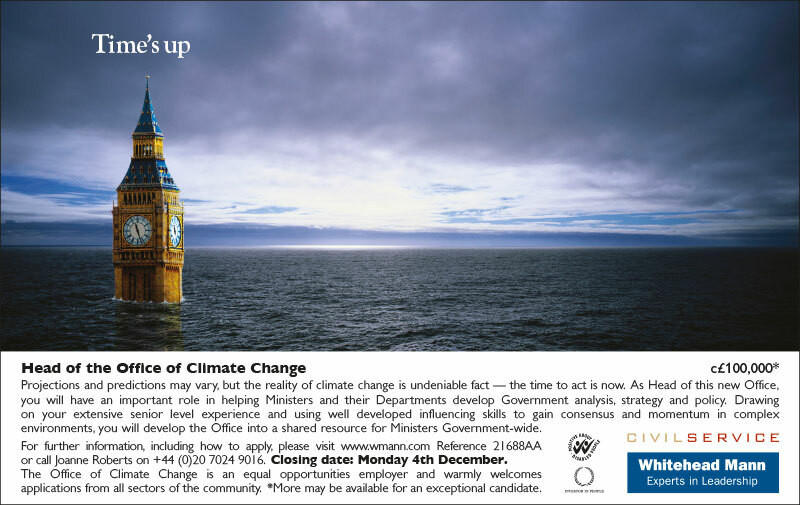 We needed a heavy hitter to take up the role of Head of the Office of Climate Change to ensure the UK led the world on these issues and by influencing others could make a real difference to ours and our children’s lives before it was too late! The end result was a ‘shock and awe’ advert. Visually stunning, we used the iconic image of Big Ben protruding through the lapping waves of a sea that had not only broken through our sea defences, but had engulfed everything that we know and hold dear. Far fetched? Perhaps. But who really knows where climate change might end. The reality of climate change is an undeniable fact — the time to act is now. The headline was simple and alluded to this fact by the use of a question mark; ‘Time’s up?’ with the image was all that was needed to be said. The advert ran in the Sunday Times alongside a search programme which pulled in a high number of quality candidates. Creatively, the work was recognised at the Public Sector People Managers’ Association (PPMA) awards where it picked up the accolade of ‘Best Senior Recruitment Campaign’ and them won the Grand Prix as ‘Best Work of the Year’. David Miliband, as Secretary of State for the Department of Energy, had personally approved our creative brief and was happy to received the award from us for his office.